In the previous post’s comments, visitor Rod pointed out that the White House has a high-res photostream on Flickr. It includes a fantastic photo of the president’s private Oval Office study, wherein you can see the staff has conveniently provided the president with a hotel-style channel legend. Man, those guys think of everything. Thanks Rod and also Colton! And thanks, White House Photo Office! UPDATE: I’ve been all thru the photostream now. Phew! What a trove! Check the What’s New page tomorrow morning! * Would I steer you wrong? Time‘s 100 Days series. Great photos inside the mansion and West Wing. Thanks, Colton and also Barry and Antonio! UPDATE: Added some of these and also another pic of the court from the UConn girl’s team visit. Welcome, Mr. Lafferty’s 6th grade class! My greatest compliments to you for the wonderful gem that is WhiteHouseMuseum.org! I am a 6th grade language arts and social studies teacher, and your website is an integral part of new year-end project on the White House. This past Thursday, 53 areas of the White House were divided up among both of my classes, and with any luck many of the students will be clicking their way to WhiteHouseMuseum.org over the course of the next week! Great to hear! I hope the class enjoys it. Welcome, kids! Having only just rid the White House of an infestation of sweetener-producing fauna, the Obamas now find themselves beset with an infestation of cuteness-producing fauna. This one is a Portuguese water dog that goes by the name of “Bo”. Completely disregarding the money-saving possibilities—let alone marketing possibilities—of White House honey, the Obamas had a swarm of bees removed from the grounds the other day. PS. Next time you’re in a restaurant with swordfish on the menu, ask the server if you can get it “with extra sword.” They love that. 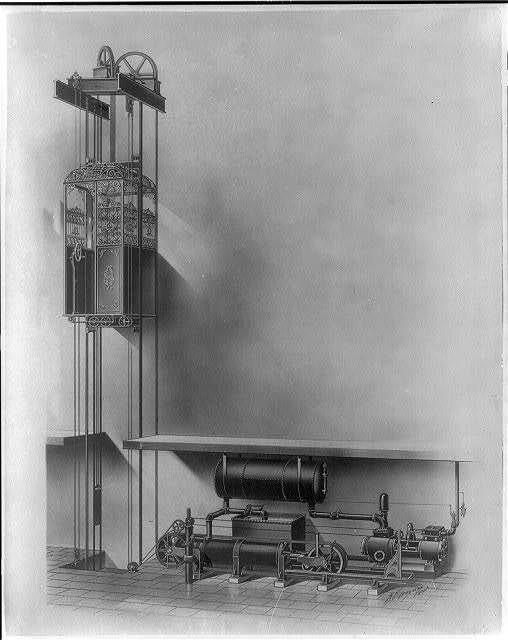 A routine search of the Library of Congress called up this tantalizing gem: an old cage elevator etching labeled “D.C. Wash. White House. North portico. Bordered with 8 state seals and busts of10 presidents” and “This record contains unverified, old data from caption card.” and “c1907”. The caption is obviously wrong, but if it really is something to do with the White House, then it’s surely the original elevator or second elevator (I think there have been four). 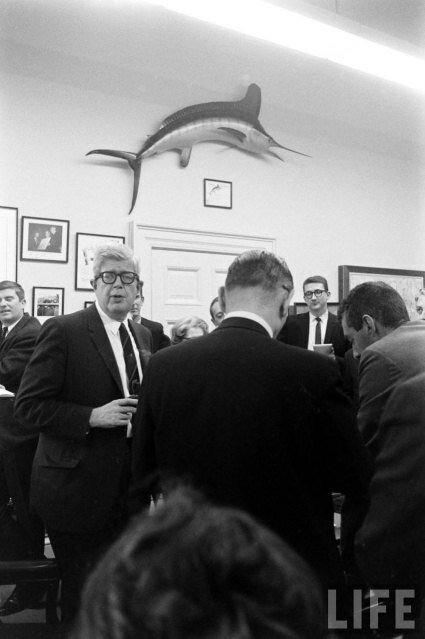 Then there’s this interesting pic of JFK in what is clearly a White House elevator, but which floor? There is a dead end where the staircase should be, which is a little baffling. Since he’s with Caroline (or is that Eleanor Roosevelt?) he could be going to her classroom on the third floor. The golf clubs suggest a part of the family quarters, maybe the sub-basement.